Every day, Watch This offers staff recommendations inspired by a new movie coming out that week. This week: The sequel Percy Jackson: Sea Of Monsters has us reflecting on stellar kid-lit adaptations. 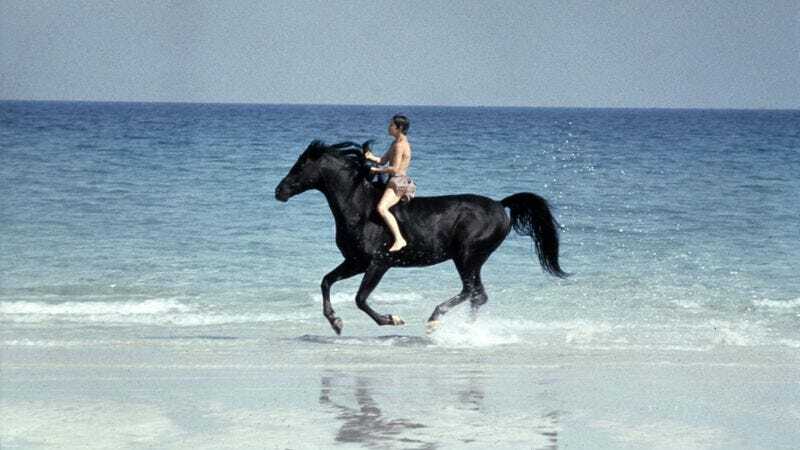 In this age of incessantly hyperactive kids’ films, The Black Stallion is nothing short of an aesthetic relic. Carroll Ballard’s adaptation of Walter Farley’s 1941 children’s novel—produced by Francis Ford Coppola, and scored by his father, Carmine—is, for large swaths of its two-hour runtime, a silent film, telling its tale through purely visual means. That tactic is immeasurably aided by cinematography by Caleb Deschanel, whose panoramas of man and beast navigating rocky cliffs, sunset beaches, and early-dawn fields and race tracks regularly achieve a sense of mythic import and grandeur. It’s one of the most purely beautiful children’s films ever made, but more than that, it’s an example of how deftly employed non-verbal cinematic techniques—patient and lucid visuals, nimble editing, emotive but never overly manipulative musical cues—can not only convey narrative (even to young audiences), but can in fact enhance the weight and meaning of the story. Ballard’s saga concerns young Kelly Reno, who after finding himself in awe of a wild Arabian horse while on a sea voyage with his father (Hoyt Axton, exuding grand paternal kindness in his two scenes) winds up befriending the beast (whom he dubs The Black) after a shipwreck leaves them stranded together on a desert island. Ballard and Deschanel dramatize this budding relationship with a lyricism that’s unforced and entrancing, and helps give the material the dreamy quality of a fable, such that specific plot particulars (such as the logistics of the duo’s trip back home) are easily ignored. Back at home, Reno and The Black team up with Mickey Rooney’s retired racehorse trainer, who proves less a surrogate father than an adult who (like the mom played by Teri Garr) recognizes, cherishes, and nurtures the bond shared between boy and steed. The climactic race between The Black and two championship contenders may provide the plot with a fittingly triumphant final note, but in truth, it’s merely one last opportunity (at least until the beautiful end credits) for the camera to lovingly gaze upon its characters running and relaxing in harmony. Availability: DVD, rental, or purchase from the major digital providers, and disc delivery from Netflix.